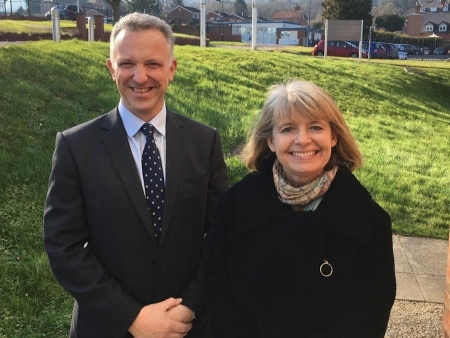 West Worcestershire MP Harriett Baldwin has welcomed the news that a major defence company is experiencing growth at its Malvern site. The MP met with James Willis, who runs QinetiQ’s Malvern site and was updated on the company’s evolving business strategy. As well as the traditional defence research work, the company is rapidly growing its cyber security and technology capability. The company currently has about 800 people working from its Malvern site, manning projects across the UK and also abroad. It is experiencing business growth and it is currently looking to recruit up to 120 people based in Malvern. Harriett commented: “QinetiQ is one of the largest employers in Worcestershire and I was pleased to receive a really positive update on how the company is growing at home and abroad. “Many generations of inventors and innovators have worked in Malvern developing world-class products but recently QinetiQ has turned its focus to commercialising this capability. Photo: QinetiQ’s James Willis and Harriett Baldwin MP at the company’s Malvern site.